GH-PC series Pressure-changed vacuum drying plant is currently used for voltage 220kv and 110kv and below the power transformer , 500kv and below transformer and other paper-insulated power equipment ideal for drying equipment, it is compared to the traditional hot air circulation drying, ordinary vacuum drying and Low-frequency drying plant, processing time reduced by about 1/3, energy consumption decreased by 30% -50%, after treatment, the minimum water content of insulating materials can be 5ppm. Its equipment investment is only kerosene vapor phase drying equipment 25% -45%. 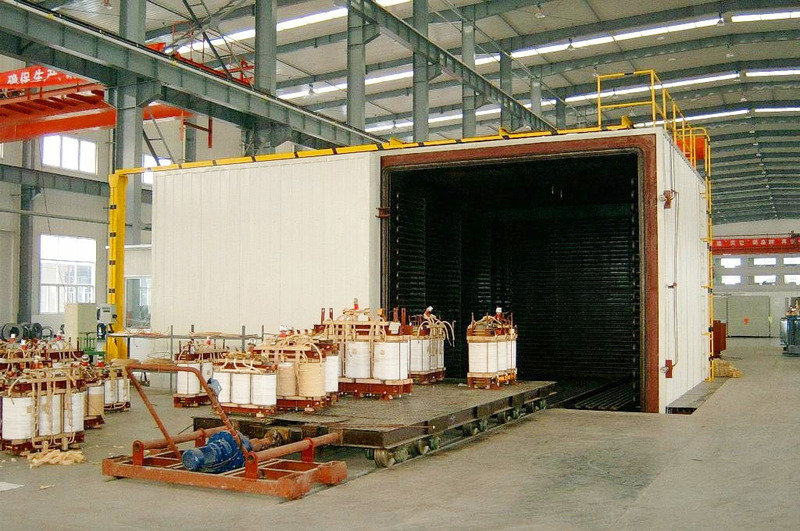 Transformer manufacturers is the preferred drying equipment. By means of vacuuming, the saturated vapor pressure of water in the environment where the coil insulation material is located is increased to make it easier to evaporate from the insulation paper. During this period, it is continuously heated to raise the temperature to ensure water the gasification energy , let the water easier to discharge. Ordinary heating and drying are from the surface, and gradually to the internal insulation. As the surface is dried too fast, leading to the shrinkage of the capillary tube of the outer insulating paper, making it difficult to evaporate the internal moisture, prolonging the drying time. Pressure -Changed method in the drying process is intermittent exhaust, making the evaporation of water vapor and hot air together in the tank thermal cycle, because the water specific heat capacity is much larger than the air, so the heating speed, and water vapor diffusible , the temperature difference between inside and outside the insulation material is relatively small. In addition, due to the general heating in order to shorten the drying time, tending to set the heating temperature is very high, which is easy to make the insulation paper on the coil surface embrittlement, product quality problems. The pressure-changed method of drying equipment, the heat source temperature does not exceed 115-120 ° C, control the core temperature at less than 80℃, so the product was dried can not have the above problems. Because of this advantage, the pressure -changed drying plant can also be used for plastic parts and other heat-resistant products, dry processing. 1, Vacuum drying chamber: According to the use of points divided into two kinds of round and rectangular, round manual lock manually open the door, the door is electrically open hydraulic locking, heated pipes arranged in the tank. Configuration trolley, for the transformer out of the chamber, in order to facilitate the general sinking the chamber below the ground to ensure trolley track and ground level. Users can also configure the air cushion vehicle. 2 ,Trolley system: a load trolley and drive device two parts, trolley for low-speed operation, sub-manual and automatic two kinds. The power of automatic trolley has the use of workshop and driving vehicle with two forms. 3 ,Vacuum system: According to the requirements of the configuration of two or three vacuum pump, in order to prevent water vapor on the pump corrosive, the system is equipped with a condenser. 4 ,Heating system: The general use of thermal conductivity of oil as a heat transfer medium, with electric heater heating oil and a forced circulation of high temperature pump, through the vacuum tank exhaust pipe heat. System configuration temperature controller, using PID regulator, temperature control accuracy can reach 1 ° C. The system can also use steam heating and pneumatic diaphragm control valve. 5. Condensation system: It is mainly used for condensing the moisture evaporated from the dried object to protect the vacuum pump effectively. General small equipment use water cooling and large equipment plus industrial chillers. 7. Cooling water system: It is mainly used for cooling of some vacuum pumps and condensers. At present, our company has developed a casting plant that does not require cooling water. 8. Hydraulic system: for the rectangular chamber door locking, but also for the tank door up the implementation. The air cushion is used to open the flap bridge. 9. Control system: It is used for the control of the whole system. There are two kinds of control modes, PLC and PLC + PC, which are all automatic control modes. The control of PLC + PC is more convenient. It can not only modify the process parameters conveniently but also record real-time parameters , to facilitate future inquiries. Devices with PC control can also set different levels of authority for different levels of operation, which not only effectively protects the process data but also prevents the quality and safety of the method.